Upsets happen in sports, happen all the time. That's one of the reasons we keep watching: if games followed a script or a form chart, they would be no different than "Buffy The Vampire Slayer" or "WWF Smackdown." Sports is television's original reality programming. Adam Deadmarsh caps the Kings' amazing series comeback with his OT goal on Chris Osgood in Game 6. But even in a sports world that churns out upsets like Minnesota produces lakes, the Los Angeles Kings' first-round defeat of the Detroit Red Wings may withstand any and all challenges over the next eight months to reign as the unlikeliest postseason result of the year in professional sports. Who in Hockeytown was ready to turn attention to the Tigers, whose 5-13 record is the worst in the major leagues, before Derby Day? Matt Millen's attempts to restore the Lions' roar? That was supposed to be a consideration for July, after the Cup finals. After all, the Wings had beaten the Kings soundly, 5-3 and 4-0, in the first two games of their series. And, yes, the Kings did win Game 3, 2-1, but that was an unusual situation created by a scheduling conflict with the Lakers at the Staples Center: no off day, a Detroit-to-L.A. flight and a late-night Sunday start that ended in the wee hours back in Detroit. But after the Wings bounced back nicely, holding a 3-0 lead with less than seven minutes remaining in Game 4, breathed there a Detroit sports fan who thought that he or she would be spending April 25 wondering when Roger Cedeño would get his first extra-base hit, rather than whether Scotty Bowman would be winning his ninth Cup? Yes, the ankle injury to Steve Yzerman and Brendan Shanahan's broken foot changed the course of the series. But the Wings still had a 2-1 lead in games and that 3-0 lead late in Game 4 -- against a team that, however improved, had just ended a streak of 14 consecutive playoff-game losses and hadn't won a playoff series since 1993. 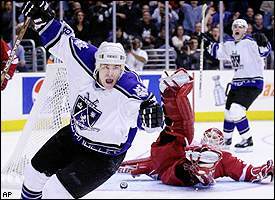 In Game 4 and Game 6, the Kings won games in which the Wings took a lead into the third period. Detroit had not lost such a game during the entire regular season (32 wins, two ties). There have been other first-round upsets before. Just a year ago, the best-record-in-the-league St. Louis Blues dropped their first-rounder to the eighth-seed-in-the-conference San Jose Sharks, and the year before, the New Jersey Devils, the top seed in the East, lost their opening series to the Pittsburgh Penguins. And No. 2 seeds lost first-round series in the West in both 1998 (the Colorado Avalanche) and 1997 (the Dallas Stars) -- each losing to the Oilers. But the Kings went about winning a best-of-7 playoff series in a manner unique in NHL history: lose Games 1 and 2, then win each of the remaining games by one-goal margins. Now, with a seven-game series against Colorado starting Thursday night, what do they do for an encore? Steve Hirdt is the executive vice president of the Elias Sports Bureau.